Just a few little additions for Moon Cresta, VBXE version as first seen on the NYD disk. Playable on Altirra emulator or 48K minimum Atari with VBXE. - Pause mode now available, press Space to pause/resume while playing. - 2 Player and difficulty now selectable. While not playing, moving joystick 1 left/right cycles through the combinations. - flashing indicator against score for current player. Note that the display for score and players/difficulty is just a temporary one and there's still plenty to be added. Big ship still in "stealth mode" when docked, that's high up on the to-do list. Use the D6 or D7 suffixed file on your machine depending on type of VBXE install. I'll periodically upload landmark updates as they happen. To-do list is pretty huge - more Pokey music to come, improvements to graphics and sounds, title screen, messages, high score etc etc. The files are kinda huge - still plenty of fat to be trimmed, and there's no compression on these ones. Edited by Rybags, Wed Jan 4, 2012 8:03 AM. Seems a lot of systems have got moon cresta recently. Looks good so far. Great that Bob (Pac-Man Plus) lent his 7800 code to you. I'm curious how you plan on approaching the standard Atari version. Are you going to go with hi-res mono or convert to 160 pixel width for more color? If you're going to go for the latter I'd be willing to help with converting the sprites. If you're going to go with hi-res I'm guessing you'll want to do some modifications to the sprites as well, as just changing all colored pixels to the foreground color does not necessarily produce a very good looking sprite. I've converted a fair amount of arcade and nes hi-res sprites to single color icons for the GUI, so I'm a little familiar with the process. I could probably be of some help there as well. Mode E multicolour is the plan for normal HW version, but probably still a few weeks away at least from making a start. There's still a fair amount of "unseen" work to do like just rearraning memory usage and trimming the program of routines that aren't relevant to the A8. Player ship will be Players, possibly with playfield for more colours but enemy colours change each level so some thinking might be needed there. Thanks for the offer, I can PM you the shapes definitions I have, although they're only in 2-colour right now. The plan with VBXE version is to add some more colour to the objects. Probably use 4-7 colours, not going overboard, then just have the palette change per level. Just realised too... the game doesn't coldstart on Reset so looks like I'll need to make another release - to make it worthwhile I guess some more features should be added also. Looking damn good so far, used to play Moon Cresta while waiting for food in the fish and chip shop, it just seemed to be the right location for it, 10 mins of blasting then off home to fill the stomach. Yea, maybe better to leave the mono hi-res alone, as XXL will probably be working on the spectrum conversion next week after seeing this anyway. There are some 160 pixel width versions out there. I played around with the CPC and C64 versions. The enemy sprites aren't too bad on either. I'd give the edge to the CPC version, as the C64 version does some of the sprites in hi-res mono to catch some extra details and it ends up clashing with the style of the rest of the sprites, looking kinda drab. The ship graphics on both of them are pretty simple, so some improvements could be had there. It should be possible to strip the sprites out of C64 version using available tools. I don't know if the same can be done for the CPC or not. It looks like Bob had to downgrade the original colors from 3 to 2 in order to get it working on the 7800. Maybe he has a copy of the original 3 color sprites that he converted? On my initial search I wasn't able to find anything out on the net. You should be able to achieve just about anything for the VBXE title screen. What is it, 256 colors at 320 x 200? Thank Pacmanplus for the accuracy with the game mechanics - check out his WIP Scramble for an example of dev speed and how accurate it is. My contribution amounts to the porting work and getting the sounds to Pokey. The real challenge will be getting it all working on non-VBXE hardware and retaining the speed. The 7800 has certain limitations - in some modes a bit selects the palette for the object so you lose out a little on overall colour possibilities. 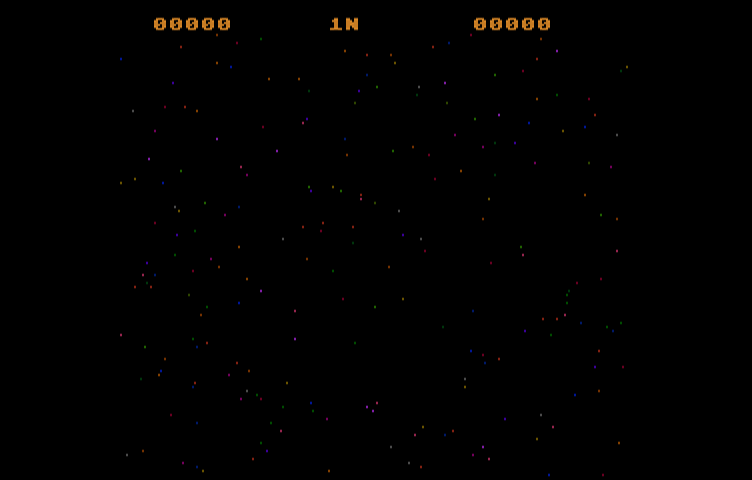 VBXE - 320 x 240 in 256 colours which are all 21-bit RGB selectable. Or 1024+ colours with some extra effort. But I'm not going to go all out with it - keeping in the spirit of the original means keeping the sprites looking sort of like the arcade. PM on the way with the sprite BMPs. Minor additions but important enough for another release. Big ship now displays properly when docked & in play. Pressing Reset reboots machine now. Where is programming information available for the VBXE? I can´t find any Information or examples that are well documented. What kind of documentation do you use? BTW: I love moon cresta! The mc15_x does not work here, but version m14_x does. Try out the files candle has on his website. Both working on Altirra, well as long as you set the version to the right $d600 or $d700 setting..
AHA...Found the culprit on Altirra, memory needs to be set to 64K for the machine..
Edited by Mclaneinc, Thu Jan 12, 2012 3:49 AM. It should also work in 800 mode / 48K. I'm trying to keep the VBXE version within that constraint - if need be I've probably got near half the VRAM still available anyway. No great leaps forward, just minor additions since the last. Next update hoping to have some graphical changes, only 2 colours shared for all major objects is kinda boring. On the 7800, using 320B mode with transparency only leaves you with two palettes, with two colors each (one for the player, the other for the enemies). You lose that third color if you have transparency. I already was doing some swapping colors during the DLI for the exhaust, ships II and III, etc. I've got a whole new set of enhanced colour sprites, thanks to MrFish. That will likely be the next release. Just need to do a bunch of work to get them in, haven't had any time since last week for it. I've just seen the 7800 version of the game on YouTube and all I can say is ... WOW! 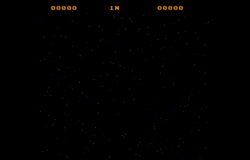 Moon Cresta was one of my favourite arcade games of all time. Haven't got a VBXE so I'll be keeping tabs on this thread. Edited by Mclaneinc, Thu Feb 9, 2012 3:15 AM. That video is the 7800 version. I don't have an up to date video of my conversion. Anyone can download it and play in Altirra anyway. Yeah, V15 doesnt appear to work on real hardware. I have my VBXE installed with a D6xx/D7xx switch.. And Niether of those V15 XEXs will run. Are you loading from a Dos or loader menu, or maybe the Aspeqt booter ? Since it's still in development, I've not tried every possible loading scenario. But for me it's worked fine from Aspeqt or the BIOS Load option from IDE +2. I tried only Altirra 1.9, wich was fine with mc14_d6.xex. Stars are moving and charcter on top changes on stick movement. Edited by 1NG, Thu Feb 9, 2012 8:42 AM. It shouldn't crash @ $7000 - that's the run address. I'd recommend update your Altirra to 2.0. Use one of the standard XL OSes... although the game should work in 48K 800 mode with VBXE also. Make sure no carts are attached. At this stage, fire button is the only way to start a game. Left/right on the joystick before starting changes the game type. Edited by Rybags, Thu Feb 9, 2012 8:51 AM.